The new iPhone XS, not expected for release until later this year, has appeared online in a leak of what we could expect albeit it in an extreme £100,000 Goldgenie version of the new iPhone. The new iPhone has leaked with many name variants from iPhone X and iPhone X Plus to iPhone SE 2 and now iPhone XS. According to Goldgenie, a company that blings up phones to sell them on with bespoke services for mind-bending prices, the next iPhone will be called the iPhone XS. The company has shown off renders, above, of what the phone will look like once it's had the Goldgenie treatment for a 24-karat gold covering. Even though this gives a sneak preview, it will still not be available until Apple officially unveils the handset in September. 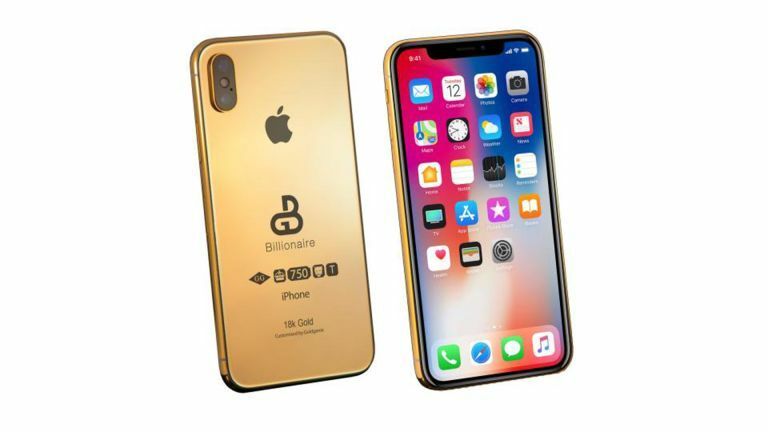 The Goldgenie iPhone XS Billionaire Edition of the new iPhone will set you back £100,000 and gets you a "24/7/365 day concierge service" says the company. That includes "sourcing information ahead of a transaction, financial advisory services, securing exclusive access, coordinating travel, organising events and personal assistance". Want one? You'll need to put down a 50 percent deposit - yup, that's £50,000. The company reveals that the new iPhone will still work despite the gold for NFC and wireless charging. Will it actually get that iPhone XS name though? We'll have to wait and see.